(Callicarpa salicifolia) A new and unique beautyberry with a loose, airy and delicate growth habit. Shiny green foliage. Mid summer through fall, it is covered with clusters of light pink flowers. 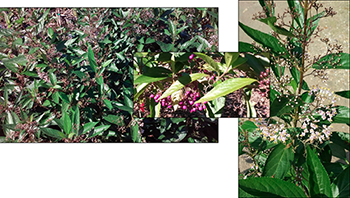 The flowering period on salicifolia lasts longer than any beautyberry we’ve seen before!! Salicifolia can reach 8′ tall. Keep trimmed back for a bushier growth habit. Lavender berries in late fall, winter. Partial sun to shade.